Following the success of Utropolis Glenmarie—a university metropolis anchored by the KDU University College—in Shah Alam, Paramount replicates the same concept in Batu Kawan, Penang. The new integrated mixed-use development in Penang, which spans a total of 44.15 acres of land, will feature the 10-acre flagship KDU Penang University College with a capacity to accommodate up to 5,000 students. 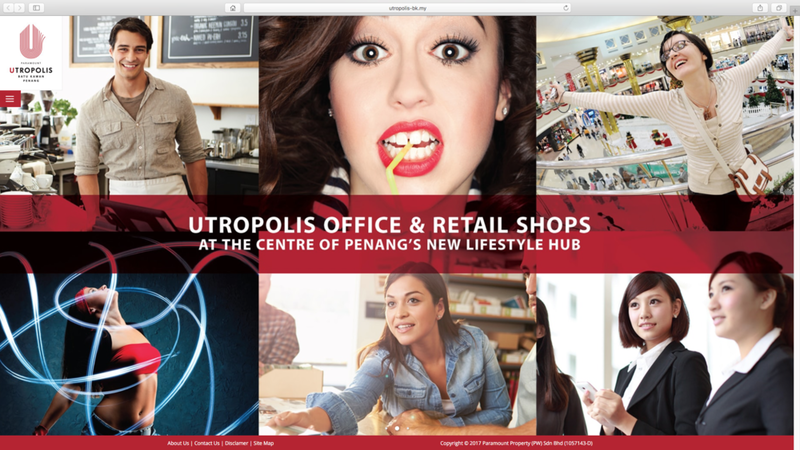 Our work for Utropolis Batu Kawan encompasses the brand positioning as well as advertising and promotional materials. We also revised the Utropolis logo to reflect the new development’s location, Batu Kawan, and selected relevant graphics/colours to indicate the personality of the premises. Aside from that, we conceptualised the main website of the development, as well as the commercial and residential microsites and promotional videos. We updated the existing Utropolis logo to reflect the new location, Batu Kawan. Batu Kawan was one of the quieter, less-developed areas of mainland Penang, but it has been recently earmarked as the next investment destination for the Penang government. With major companies such as Robert Bosch, Boon Siew Honda, and VAT Manufacturing Malaysia pledging investments to build their manufacturing plants in this town, Batu Kawan is set to grow as a major industrial hub. The brand positioning of Utropolis Batu Kawan takes some of its cue from this new status of Batu Kawan. While Penang Island is still widely known as a “branded” location that prides itself in its properties and beaches, the mainland of Penang is slowly catching up—with Batu Kawan as one of its forerunning, concerted effort. In time, it may even come to represent Penang. The tagline that we proposed for Utropolis Batu Kawan’s reflects this ambition: The New Face of Penang. We designed various marketing collaterals to promote both the commercial and residential premises, including the brochures, micro brochures, hoarding, posters and buntings, and billboards. With the development positioned towards a mix of Gen X and Gen Y buyers, the main website and microsites need to be conceptualised to appeal to both groups. 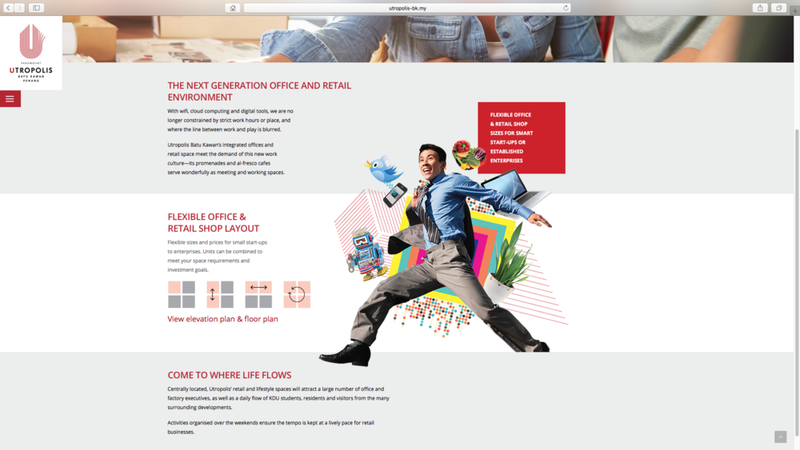 We designed it to concurrently convey solid and relevant information, as well as a youthful, vibrant spirit. Two promotional videos were made for Utropolis Batu Kawan: commercial and residential. The commercial video is conceived to be factually inclined, while the residential more lifestyle.